T nities his is a different concept— a continuing service ... all year long... that alerts you to new Navy sales opportu- . as they happen ... fast,— ahead of your competitors. Navy contract data vital to your sales success. You no longer have to search for, analyze or organize sometimes in- complete information from diverse sources. Now ... the work is done for you. Data Base is cross-indexed 5 ways: 1. Indexed by Company—more than 300 companies are included. 2. Indexed by Equipment or Service —35 individual categories are referenced. 3. Cumulative Awards by Company —cumulative ranking. 4. Contract Awards by Company with current $ and contract num- bers. 5. Data base of over 1,250 contracts with descriptions. • TWICE MONTHLY UPDATES— fresh new information (over 100 contracts per month)—including latest contract awards, deletions, changes, etc.—indexed by company and punched for easy inclusion in the original data base binder. 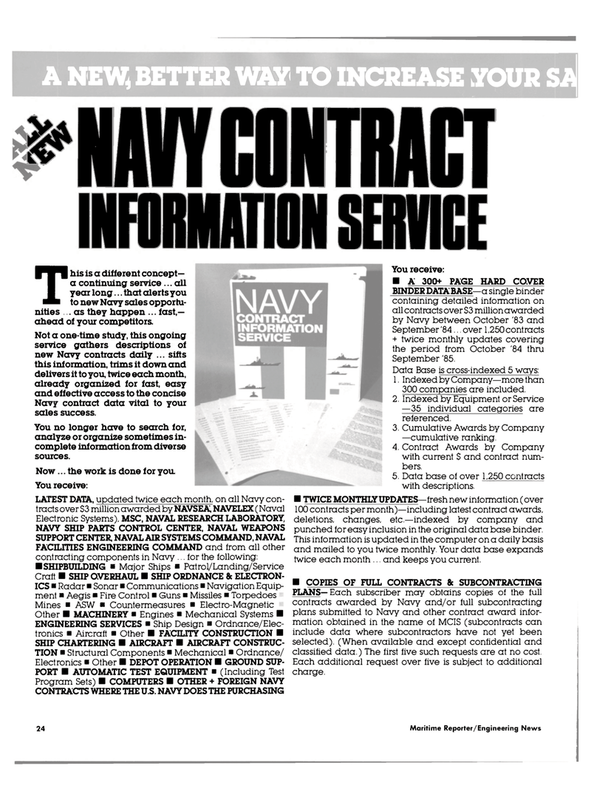 PLANS— Each subscriber may obtains copies of the full contracts awarded by Navy and/or full subcontracting plans submitted to Navy and other contract award infor- mation obtained in the name of MCIS (subcontracts can include data where subcontractors have not yet been selected). (When available and except confidential and classified data.) The first five such requests are at no cost.